The Sheiling for 2 people is a small but spacious wooden chalet, often described as 'Dr Who's Tardis' as it looks much smaller on the outside than on the inside. It has a fitted kitchen with cooker, fridge and microwave and a remarkably big bathroom complete with wash basin, bath and power shower. The bed sitting room comprises of two single beds, a bedside cabinet and separate reading lights over each bed. The sitting area has two very comfortable chairs which can be re-arranged for your own comfort, for relaxing, watching TV, listening to the wireless, playing CDs or just reading a good book. 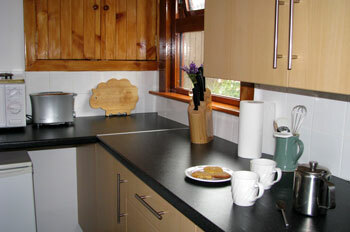 There is a fold-away dining table and chairs and also a well stocked bookcase in the entrance porch. The bird feeders outside your windows are filled daily and there is a picnic table on the lawn outside the Sheiling for your use. This year all our beds have brand new Mattresses for your comfort. The Sheiling: Tariff £350 per week. Don't be disappointed, book your holiday now. 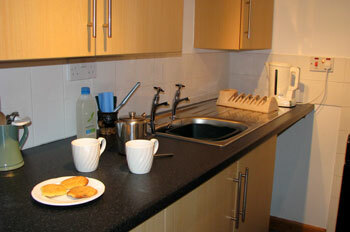 Washing machine (on request), freezer space, cot & high chair are available on request. Bed linen, towels, tea towels, cleaning fluids, electricity and oil fired central heating are all included in the price. 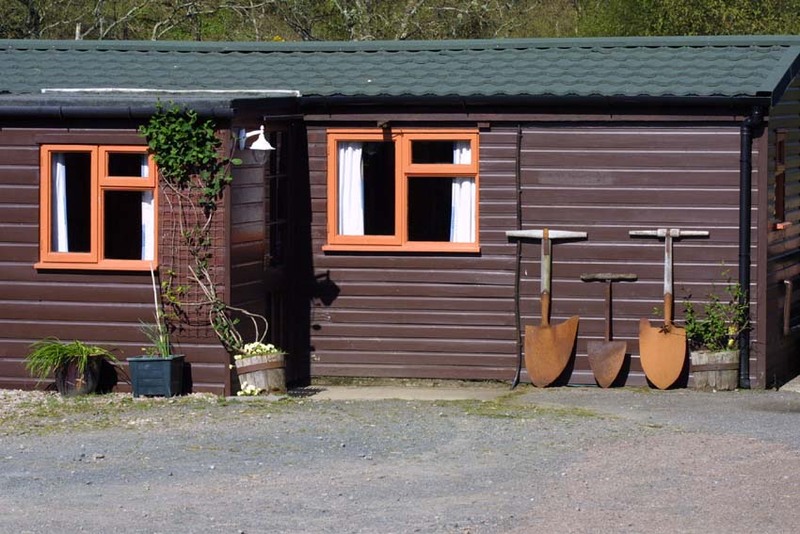 We also offer the use of our large barn for bikes etc. Arrivals and departures: The cottage will be ready for you by 4.00 pm on the Saturday of arrival and we ask you to vacate the house no later than 10.00 am on the Saturday of departure. Sorry no pets due to farm animals. Please note we have no hidden extras, the price includes everything. A non refundable deposit of £125 for Inch Hame and £100 for The Sheiling is required to secure a booking. On receipt of the deposit I will write to confirm the booking. Customers are advised to insure against cancellation. 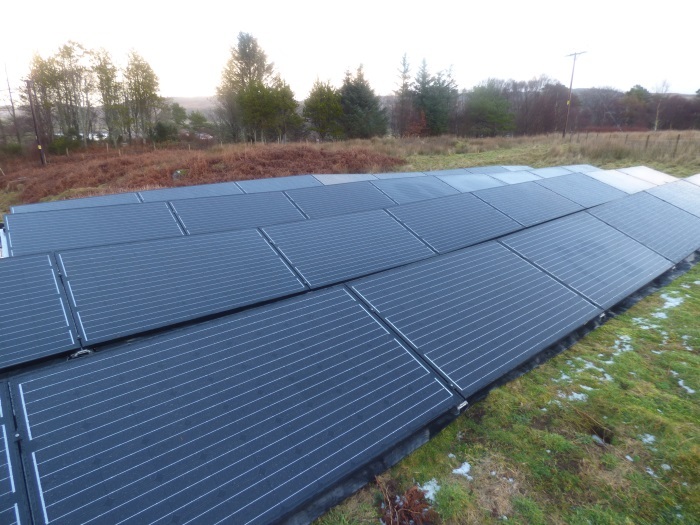 At Ardrioch we are trying to be 'Greener' and so to this end we have put in Solar Panels to produce electricity for both our home and our self-catering cottages. During the summer months the electricity that you use will come from our Solar power. The panels are discreetly positioned, out of sight away from the house in one of our fields. We also try to use Eco light bulbs, ecological cleaning products and recycle as much of our waste products as we can, including using the compost heap at the bottom of the garden which is also a winter home to Slow Worms.